In the Sengoku (Warring States) period in Japan, warlord Daigo Kagemitsu makes a terrible deal with 48 demons. In exchange for more power, he allows the demons to take whatever parts they want of his unborn son. Later his son born as a limbless, faceless creature. Upon seeing his son, Kagemitsu realises the demons have accepted the deal and late orders his wife to abandon the child by sending him downstream in a basket. The child is later found in the river by a man named Dr Honma. Honma cares for and raises the child and later carefully constructs prosthetics for to replace his missing body parts. As he grows into manhood, monsters and various ghouls visit him. One of them explains that his body parts have been taken away by 48 demons and that he has to defeat them in order to get them back. Now known as Hyakkimaru, the young man sets out on his quest to slay demons and various monsters in order to regain his original body. In one town he comes across a child thief named Dororo and saves him after the locals beat him for stealing. Dororo decides to follow him in order to steal his swords. Hyakkimaru attempts to discourage Dororo as much telling the child that demons and monster follow him around. Sure enough that night a strange monster comes out of the lake while Hyakkimaru. This scares Dororo, but not enough to stop following him. In the next village they tell the locals about the monster which came out of the lake. However the pair are captured and held prison by order of the village’s female chief, Bandai. However at night, a monster comes of the well and attacks Hyakkimaru and Dororo. When Hyakkimaru eventually discovers the secret of the monster and destroys it, one of body parts grows back. This leads the villagers to believe that Hyakkimaru is some kind of monster and force him to leave town. This happens in all villages that Hyakkimaru kills demons in. Even as Hyakkimaru regains his humanity piece by piece, he is still considered a monster. This TV series is based on Osamu Tezuka’s manga from the late 1960’s. It’s a really bloody and dark story with quite a lot of on screen and explicit killing, depictions of war and grotesque monsters. Apparently the material was way too dark for Fuji Television Network back in 1969 and they asked for the story to be toned down a bit. This included the addition of a small dog to the duo of Hyakkimaru and Dororo. The dog, Nota, strangely wears an Eboshi, a traditional headdress worn by men who had come of age (in modern times seen on the heads of Shinto priests). Still this addition and the toning down of the material of the manga could hide the bleakness of the graphic depiction of battlefields with hundreds of dead of the Sengoku period. The bleakness also extends into rural and village life with the townsfolk being terrorised by bandits and soldiers alike as well as the occasional demon and monster. The series, directed quite skilfully by Gisaburo Sugii (“Night on the Galactic Railroad”, “Touch”), was produced in black and white which was unusual for the time as the vast majority of anime were being produced in colour. This was probably a financial decision, yet it doesn’t lessen the impact of the bloodshed. Dororo’s backstory is also explored early on and it’s just as tragic (perhaps even more so) as Hyakkimaru’s. Dororo’s family was part of a bandit clan, but ended up being betrayed in a move for other to gain more power. Dororo’s father eventually killed and her mother dies in a snowstorm as she tried to protect Dororo. In a war torn society, Dororo is forced to become a thief to survive. As the series progresses, Hyakkimaru and Dororo develop a deep friendship and look out for each other as Hyakkimaru kills as many demons as he possibly can in order to get his body back. Hyakkimaru’s prosthetics are quite interesting. Besides two swords for arms (hidden inside detachable prosthetic arms), he also has some sort of gas inside one of his legs, though it is never fully made clear what it actually is nor how it works. The only problem with a lot of prosthetics is that they never seem to make a whole lot of sense or seem be centuries ahead of technology of the time. At one point in the series Hyakkimaru claims he can’t see, hear or even speak (until the demons that took those parts are killed and he receives them back). In the manga it is explained that Dr Honma was an alchemist, though I don’t think this even mentioned in this this anime adaptation. As the original manga was actually cancelled before it finished, about half way though there are a number of original stories including the ending. While it’s a bit rushed the ending is pretty amazing. The anime was also renamed mid-way though the series from “Dororo” to “Dororo and Hyakkimaru” to acknowledge the fact that Hyakkimaru was indeed the main star of the show. Apparently Tezuka’s intention for the manga was to let it develop into a coming of age story about Dororo but of course this never happened. Fans of Tezuka will be quite familiar with his “star system” where characters reappear throughout his work. Maybe because I’m far more familiar with posthumous anime adaptations I was quite surprised that only one of his previous characters, Acetylene Lamp (who appears briefly as a bandit), makes an appearance in the series. 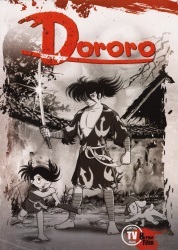 Originally “Dororo” was streamed on the ill-fated Anime Sols website. The business was shut down before people had a chance to crowdfund DVD sets of the series. Luckily Discotek decided to licence the series. The DVD set is pretty good for what it is. The source material is better than I had hoped for series of this age. There are some aged film artefacts in the video, two next episode previews are missing (and are audio only) and there is some really notable aliasing in some episodes. I suspect is maybe due multiple video sources being used, but I can’t be sure. The set also includes a colour 15 minute pilot film (with different voice actors) and unlisted storyboards of the final episode. This set could do with some liner notes, but I’m just glad it even got a home video release. Overall this is a pretty good series. The story telling shines through nearly 50 years after its original broadcast. Sure the animation may be rather limited, but the cinematography is brilliant. The content is quite bloody and dark and not even the upbeat theme song and addition of a cute dog can hide this fact. Apart from the minor quibbles I have with function and practicality of Hyakkimaru’s prosthetics, there really isn’t too much I can fault this show on. Despite the darkness and gloom, the strange and grotesque monsters and the pair’s journey make a really fun show to watch. 7 out of 10. Remaining Backlog: Two movies, three OVAs, six TV series. In addition I am also waiting for second parts of for eight TV series and one OVAs to be released before viewing them.